Grilled Zucchini with Rhubarb Glaze is such an easy way to add another dimension to zucchini. Sure, grilled zucchini with a little garlic and S&P is amazing as it is, but the added sweet freshness will be a pleasant surprise for your taste buds. I've been thinking about integrating fruit into more recipes, as I probably do every summer when surrounded by fresh local produce. The idea of a rhubarb glaze has been bouncing around in my head for a while as well. It could be used for all kinds of stuff. Cocktails, salad dressing, grilled meats (rhubarb is great on chicken – in fact, we have 2 BBQ sauces: Curry Rhubarb BBQ Sauce and Rhubarb Habanero BBQ Sauce), drizzle over ice cream, pancakes, waffles, or your partner. I know, I know: I said the same thing about the Creamy Curry Fenugreek Sauce. I read some recipes that used a rhubarb glaze on cheesecake. Yessssssss! What is your favorite use for rhubarb? Growing up, what did you have with rhubarb? There are two things that come to mind: rhubarb sauce and, the best thing ever: lunar rhubarb cake. I'm drooling just thinking about it. It's a rhubarb cake that is sprinkled with brown sugar before it was baked. The result was a crater-like surface once it's cooked. Is this something that other people have experienced? It is a Canadian thing, I think from the 80s. I need to paleo-ize this some day. Grilled Zucchini with Rhubarb Glaze obviously doesn't have the sugar of the lunar rhubarb cake. In fact, it's pretty friggin' healthy. Enjoy! 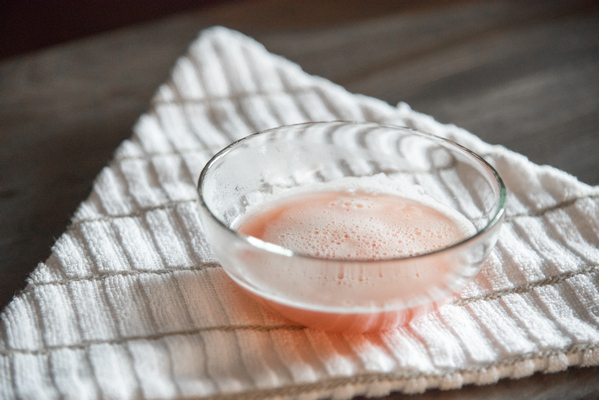 Bring rhubarb, water, lemon juice, and honey to a boil for 5-8 min, so that rhubarb is tender. Use a strainer to separate the liquid. Add more water to the solids and strain again if needed to get 1/4 cup liquid. Mix arrowroot well with cooled liquid, heat until it starts to bubble, then remove from heat. Cut zucchini into lengthwise 1/4″-thick strips, brush with oil, lightly salt, and grill both sides on BBQ. Brush rhubarb glaze over grilled zucchini. Enjoy! Save strained portion to eat as rhubarb sauce – with cheese and or raisins. I mixed mine with a couple other sauces to make a BBQ sauce for chicken. Love how simple this recipe is. Zucchini is one of my favorites and a new recipe is always nice! What an unusual combo…and I am always looking for ways to use rhubarb! I bet it was amazing mixed in for a BBQ sauce too! Definitely. I think rhubarb is under utilized and that it should be bigger than… pumpkin spiced everything! Love this combo! Almost salty zucchini with sweet and sour – what a great match! Perfect way to use up the last of summer’s sweet bounties! We are drowning in zucchinis right now. Now I know what to make. I love rhubarb! I wish the season wasn’t so short here during the spring, but it’s something to look forward to the next year. This glaze sounds so good! I would slather it on so many different foods – I bet it’s amazing on grilled zucchini though. I was wondering how easy it was to find frozen rhubarb. I don’t think I’ve ever seen canned rhubarb. What do people do that don’t grow it? What a wonderful recipe perfect for the fall season! I love rhubarb and it is fantastic to have a savory recipe to use it in. I love that you used it in a sauce. So creative and brilliant! I know just the rhubarb cake you’re talking about, so good, my Aunt used to make it growing up! 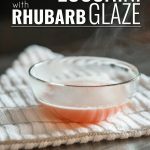 This rhubarb glaze does sound incredible and I’m already hooked on grilled zucchini, so I can’t wait to give this a whirl! 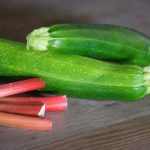 I never would have thought about pairing rhubarb and zucchini! I certainly need to be more adventurous. Thanks for sparking my interest! Always looking for new ways to use my rhubarb and zucchini — looks like a great recipe! Agreed! What are some of your favorite rhubarb uses?